So first things first, none of the books are called Jack Reacher, which is the name of the film, not that this is a bad thing, clearly Jack Reacher was clearly meant to start off a Jack Reacher franchise, so it is forgivable you want to burn the name of the main character into the public consciousness. However confusion was caused as it was originally called in pre-production the name of the book it is based One Shot. Now when I first heard that it was one shot, I was rather confused, you see, One Shot is the 9th book in the series, and while they don't rely heavily on continuity (very few characters or locations continue in our drifters tale), then there are some key things that Jack Reacher has gone through by the time One Shot rolls around. Equally however, One Shot is a damn good book, it has one of the clearest sets of bad guys of a Lee Child (the author) book, a tight plot, an immediately obvious crime for Jack Reacher to investigate, rather than "funny business" leading to a more serious crime, and he gets into more fights than is the series average. Overall, not the worst choice, not the best. Not that anyone is asking, but if I had to suggest a book for him to be in, I would say one of the first two, they generally introduce the character much better, and he was more human. (I'll get to that after this in a few paragraphs actually). Here is a funny thing I noticed, Cruise rarely stands directly next to someone. They are either far away, or sitting down, or he stands alone. Preamble to Review:So both we deal with Jack Reacher's humanity, let us talk about JR in the book, and then JR in the film. So Jack Reacher is an ex-military police man(that is, an ex-policeman in the military), he has a problem with authority, he has a brain hardwired for Detective skills, he is incredibly attractive, incredibly able in a fight, with a gun and in a car, he is a master of observation to rival Sherlock Holmes and, perhaps most vitally in terms of this paragraph, he is 6 foot 4 inches, and built like several outhouses. Then we have Movie Reacher...Tom Cruise, a 5,7 pretty boy who is vaguely streamline and played possibly one of the gayest military men of all time (Maverick). 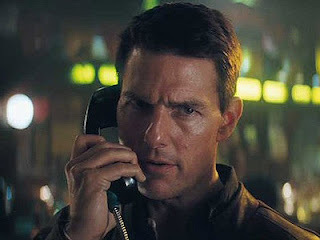 So this presents a problem, upon the announcement that Cruise's production company (inventively called TC Productions, don't strain yourself Tom) had purchased the movie rights, and that TC himself would be playing Reacher, there was a suitable burst of Internet outrage from the very small but vocal minority who had read the books, I did not participate myself of course, that would be barbaric, I merely pent up my rage until I founded a surprisingly popular popular culture website to write on. To this date there is a "Tom Cruise is not Jack Reacher" fan group with about 10k membership, which I'm assuming is quite a lot of the readership? As I said, I'm sketchy on the figures, even if it isn't, then I think most people had considerable doubt about Tom Cruise's ability to play a 6,4 behemoth. Virtually every other actor has been suggested, Sean Bean, Ray Stevenson, Liam Neeson, Viggo Mortensen, and many more have had their name thrown into the arena. 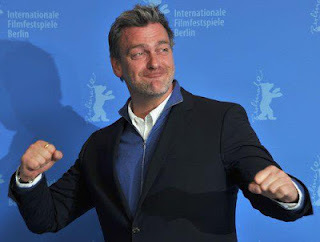 I quite like the idea of Neeson or Ray Stevenson, though Taken 2 sales have been dropping. But it matters little, TC is Reacher now, at least for this film, so let us finally get down to the actual film (Told you this would be a strange review). Picture of Ray Stevenson from the "Tom Cruise is not Jack Reacher" facebook. He was never meant to be pretty, just kind of burly and ill-kept. Remember, he is a drifter. Tom Cruise looks anything but a drifter. Review: So the movie itself, for all the doubt and dislike I had going in...Isn't terrible. Sure it has a fairly lackluster starting act with only 2 good scenes, neither of which involve Jack Reacher and both pertaining to the Sniper who randomly shoots 5 civilians, one being the actual opening scene, entirely silent of dialogue in an unusually strong trust-hook for the audience, and then a scene where Reacher replays in his head how each person reacted to the shooting. Both are done in quite a harrowing, dramatic way, pulling very few punches. The rest of the film would try and be like this, but unfortunately when Tom Cruise is on the screen, you become very aware that that is the aim, and the scenes lose all their gravitas. I wouldn't even put this down to him being too short, he just lacks the conviction to put across such lines as "Don't think I'm a hero, I'm not a hero". The rest of the cast is fairly standard, Robert Duvall and Werner Herzog fill out the only two roles that were "very good", and neither is in it for more than 20 minutes scene time. The woman, Rosamund Pike, former Bond Girl gives a forgettable performance as an idealistic lawyer whose dad is the district attorney of the state, given an equally uninspiring piece, which is a shame because Richard Jenkins was really good in Cabin in the Woods. The henchmen are your standard affair, you have the nervous underling, the big bad jr, and the slow strong guy. This character Tom Cruise is talking to, Sandy, calls him "Mister". I know Jack Reacher was already an unashamed male power fantasy...but yeesh. The fights scenes aren't terrible, his generic beat down of the first five thugs is forgettable, bordering on laughable when you realise Tom Cruise is suppose to be physically imposing to these people, despite the fact he isn't taller than any of them. There is a really nice close-quarter combat scene about half way through, during the fleshing out of the investigation role (He is investigating the sniper case mentioned above). The ending gun fight is a low intensity affair between about 7 people in a construction site, which fits the realistic tone nicely in the books, given as you only see things from Reacher's point of view, but as the film has to show you the rest of the battlefield, it feels more like a dot to dot as Tom Cruise effortlessly takes out each combatant. Reacher at one point has a gun to his head, but then they "settle it like men". You will find plenty of old-ground here. Which is what I was going to mention quite a few paragraphs ago. Jack Reacher is infallible. Now this isn't a major problem in the books, as you are frequently privy to Reacher's thoughts, and are aware that he projects the persona of being unbeatable as a quite clever tool in his arsenal. The film, however, doesn't have Tom Cruise inner-monologues, and so Jack Reacher, for the entire film, seems like a cocky, self-assured pretty boy who never once makes a mistake, and coldly, logically, and smugly solves everything very efficiently. It was laughable to watch, at no point does he ever do a thing wrong, even his levels of moral ambiguity are measured to perfection. I can understand why the audiences didn't dig this film completely, neither did I, even with the books prompting me to like the character. The guy I saw up there, disappointingly, was only half of Jack Reacher (and that isn't even a short joke). To Conclude: So sorry that wasn't much fun, perhaps I should have split it up into review and then Book commentary, but frankly, I don't really fancy thinking about this film again for a while. I'm just thankful that tomorrow I'll be watching Django Unchained, and then very soon after that, Lincoln will be at the cinema. Isn't the award season great. But yes, like I said at the top, if you want an opinion on Jack Reacher. 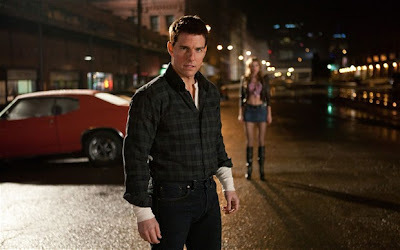 Read the books, because there is very little Jack Reacher in Jack Reacher. If you want an average action movie with glimmers of good buried deep beneath inadequacy, well, go crazy. Burly and ill kept...thinking Rutger Hauer when he was a bit younger? Its frustrating how film makers change the looks of main characters to sell tickets or fit stereotypes. Scientology? The ones who 'charge exhorbitant fees for their religious services'? Do you think they saw him coming? The one and only, though you could say most religions do that, given how anything is unreasonably high for their services. I really happy found this website eventually jason statham jacket for sale. Really informative and inoperative, Thanks for the post and effort! Please keep sharing more such blog. Now I saved it to my bookmarks so that I can keep me in touch with you.